UPDATE: A keen reader pointed out today that Mayor Hancock was a no-show at the Stock Show bill signing yesterday. We are eagerly awaiting Hick’s protests about the clear snub from Team Hancock and The Denver Post‘s editorial about it. Hancock’s participation would have been easy – he just has to show up. In fact, it would be far easier than rearranging 2,200 people (padded number to include teachers and staff) with one week’s notice. Of course, if Hancock had a scheduling conflict, it would be clear that he simply does not hold the Governor in high enough regard. Right? 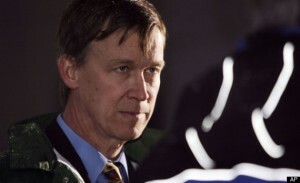 Perhaps it’s not surprising that Governor Hickenlooper is whining about not being able to sign a bill at a Jefferson County high school. He’s notoriously thin-skinned. But, what makes this narrative overreach particularly distasteful is that the Governor’s staff seems to be mocking a school district for doing what it thinks is best for students. According to several news reports, the Governor’s team approached one high school in Jeffco School District that independently told the Governor that the logistics of a bill signing at that school were impossible. Then, Team Hick approached union-hotbed Lakewood High School, and the principal told Team Hick yes, but never actually cleared it with anyone from the school district, including the district’s security. After the district learned of the plans, it became apparent that Lakewood High School would not be able to accommodate the Governor’s request. Here’s why: according to Wikipedia, Lakewood High School has nearly 2,100 students. The Governor wanted to come during the school’s busiest time of day (in the morning) and during the district’s busiest week (as kids are taking finals and as graduations are taking place). So, with a week’s notice, the Governor wanted the District to move mountains so he could sign a testing reduction bill there, interrupting finals for 2,100 high school students and stretching thin security meant to help staff graduations and keep kids safe. In the Denver Post, Rep. Brittney Pettersen noted that the district had accommodated bill signings in the past, which a district spokesperson confirmed. In 2014, two bills were signed in Jefferson County Schools. One bill was signed at Kendrick Lakes Elementary School (note: no finals, no graduation) at 2:30 p.m. (note: late afternoon timing) and at Standley Lakes High School on May 16th, before graduation and finals were in full swing, at 2 p.m. (note: afternoon timing). And, in fact, Superintendent McMinimee told the Denver Post: “If it was at 2:30 in the afternoon, we might be having a different conversation.” McMinimee even offered to have the Governor tour Jeffco to learn more about the district at a less-chaotic time. All of this seems completely rational. So, why is it that Hick, Alan Salazar, and Sen. Andy Kerr can’t stop politicizing it and won’t stop talking about it? The only one playing politics here is the Governor’s office. Since when does his location preference for a bill signing trump school safety and kids’ education? Shame on you, Governor, you’re overplaying your hand here.